My last post introduced the idea of the satisfiability of a post-production quality assurance protocol. We said that such a protocol is not satisfiable for a given size of the sample from the unretrieved (or null) set if the protocol were to fail the production even if the sample found no relevant documents. The reason a protocol could fail in such a circumstance is that the upper bound of the confidence interval on the missed relevant documents could still be above our threshold. Generally in statistics when we think about such tests, we look for something more than satisfiability. Rather, we think about how confident we are that what we consider a sufficiently complete production would fail the protocol — what is known as the power of the test. Power stands in tension to the strictness of the test, the confidence required for passing the threshold. The stricter our test, the less likely bad systems are to pass, but the more likely good systems are to fail. A production only passes QA if we have 95% confidence that elusion is no more than 1%. So now we need to decide what actual sample size is appropriate for our protocol. This decision hinges on two questions. The first question is how confident we want to be that a good production would pass our protocol, what is known as the “power” of the test. A power of 80% is a common choice. The second question is what we would consider a “good” production. More generally, for a given sample size, we can state the probability that a production of a given level of performance will pass our protocol. For instance, if our sample size is 1000, and the production has actual elusion 0.5% (half the threshold amount), then it still has a 56% chance of failing our protocol. (In R, 1 - pbinom(5 - 1, 1000, 0.005), where 5 is threshold failure sample positives calculated earlier). In fact, the maximum elusion that would have at least an 80% chance of passing our protocol is 0.23%, under a quarter of the threshold amount (in R, 1 - qbeta(0.8, 1000 - (5 - 1) + 1, 5 - 1), exploiting the relationship between the beta and binomial distributions). A production only passes QA if we have 95% confidence that recall is no less than 50%. From the figure we can see that, if we are going to validate our production with a post-production sample of 2,400 from the unretrieved set, then there’s no point performing the validation unless our retrieval has found at least 2,700-odd relevant documents, because otherwise even a good production can fail the validation. And, if we set the upper bound on the number of documents we’re prepared to look at during validation to 10,000, then productions of less than 640 documents essentially cannot be validated, unless we’re prepared to loosen our validation requirements. 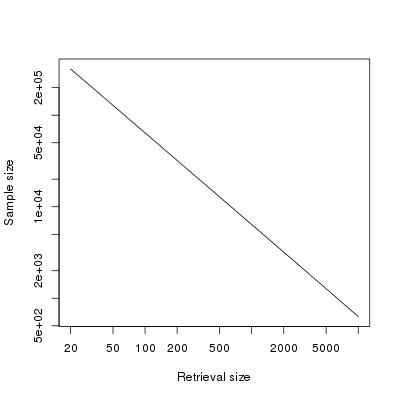 If, for instance, we set the threshold recall at 30%, and require only 90% confidence in beating this threshold (while retaining 75% recall as our definition of an “good” retrieval), then required sample size falls from around 10,000 to below 2,000. But we’d want to be sure that we’re willing to accept the reduced confidence and lower threshold. In summary, the feasibility of using sampling-based methods to validate the recall of an e-discovery production is highly sensitive to production size. 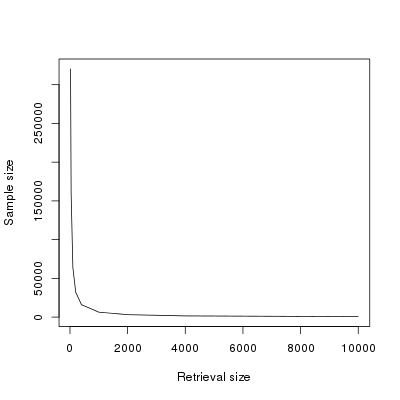 For small productions, strict protocols will require an impractically large sample size. Protocol parameters should be determined with an eye to expected collection yield and production size, and where expectation or (production-independent) evidence suggests relevant documents are rare, alternative levels or methods of production validation must be considered.